Had this little fella for a couple weeks and have a 65 QT on the way. Got sick of ruining standard coolers but couldn't bring myself to spring for a yeti. Enter RTIC Coolers. Also have a few of their coffee mugs and coozies (wife drinks pretty slow, also great for golf in summer heat). Nice gear. Probably still overpriced, but looks cool. I know a few fisherman that like them as well. Good coolers. 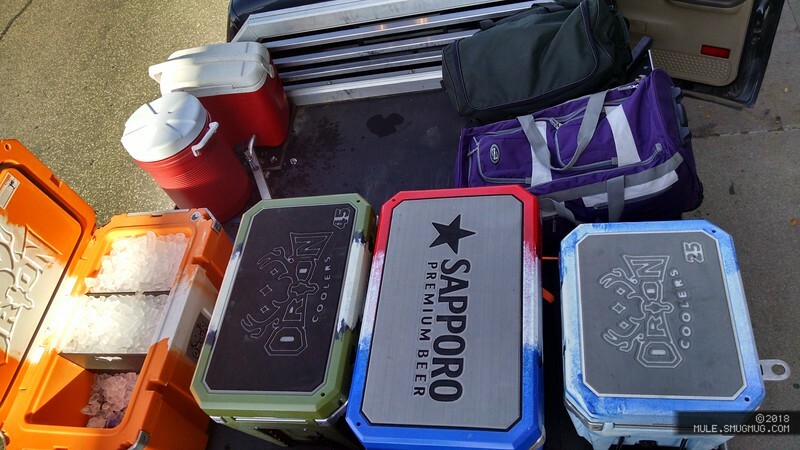 Got connections with Orion Coolers... we picked up a few for the new trailer. Well-designed, and well-featured. IMO they're better thought-out than the other rotomolded brands. Spinoff of Jackson Kayaks, if you've ever heard of those. I'm kinda partial to ARB fridges. I bought both of ours used at $500.00 each. The Yeyi style coolers are great, but ice takes up an enormous amount of space, even if it does last for days. A friend has been yakking for a couple of years about getting a better cooler, and it looks like he'll get an Rtic this summer. I bought two Orca 58s a couple of years ago after doing a bunch of research. Research indicates that the differences among the high-end coolers are not all that great, and you should buy the one that physically fits your truck best or that you can get the best deal on. Orca fit the bill for me on both counts, but I got them as blems for $250 each, delivered. Orca is no longer selling blems, but I think Yeti and maybe some others still do. WalMart has a new line of Ozark Trail coolers (house brand) that look like a very good value, but so far only available in the large 73qt(?) size. Any of these in the 50qt and larger sizes is very heavy when loaded, so mine stay in the truck when full. I also have an Indel B fridge in the truck, but I still carry the Orca on trips when I'm not alone. I still like the Orion coolers. It's what "high performance" coolers cost these days that pushed me over the edge towards the 2 ARB fridges we bought. I have absolutely zero regrets. That said, it is still handy sometimes to have a cooler. Outdoor get togethers & parties are where coolers shine. Don't want idiots or drunken people who know nothing about working an ARB fridge latch to break it. They can & do break. I just gave my daughter our 2 Coleman extreme 75qt coolers. I am leaning towards a Yeti or similar. I'm thinking I like the space saving design vs the one with the molded in handles that stick way out-like the Cabela's Grizzly coolers. If you are regularly filling them full, then they would be handy, as you would need 2 people to lift it. I use my 25 qt every day. Love it. The 65 gets pulled out for hunting/camping/extra party space. Love it. However, I easily get the most use out of the RTIC 20 soft side. Doesn't keep ice as long as the roto molded variety, but super light and convenient for pool days, tailgating, or any scenario that a man doesn't want to lug around a tank. Most applications I use if for, I don't even need ice. Pretty handy. Wife really likes it.